That’s what I’m hoping to answer for you today, as well as share what I’ve discovered are 5 Benefits of Using Piano Wizard to Learn How to Play Piano. Piano Wizard is a program for learning how to play the piano. It uses a computer game format and starts the kids out on a piano keyboard sitting at the computer. I’ve never tried a piano learning program like this before, so it was fascinating to see how it works. Level 1: See shapes go up and play them on your keyboard at the right time. Level 2: The piano keyboard on the computer screen has now been turned vertically. The student still plays the notes by watching the shapes and colors. Level 3: The shapes are now colored notes on a staff to prepare them for reading music. They move sideways. Level 4: Next, the colored notes are real black notes. Level 5: Then take the actual sheet music over to a real piano and play the song. 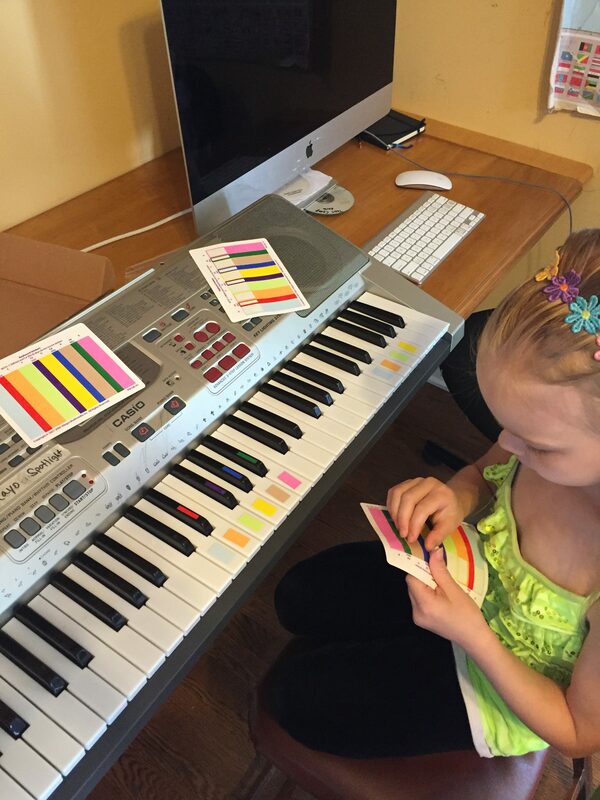 Placing the colored stickers on the keyboard so the notes are matched to the game. I usually recommend that students begin playing the piano at about age 7. 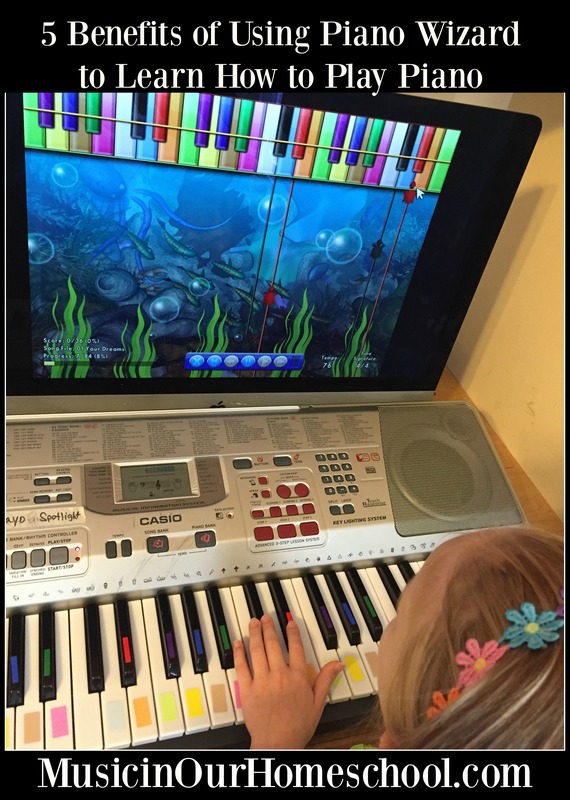 With Piano Wizard, they can begin as early as age 3 because they can use a keyboard with small keys to fit their hand size better. 2. It’s a game, so kids are excited to practice. 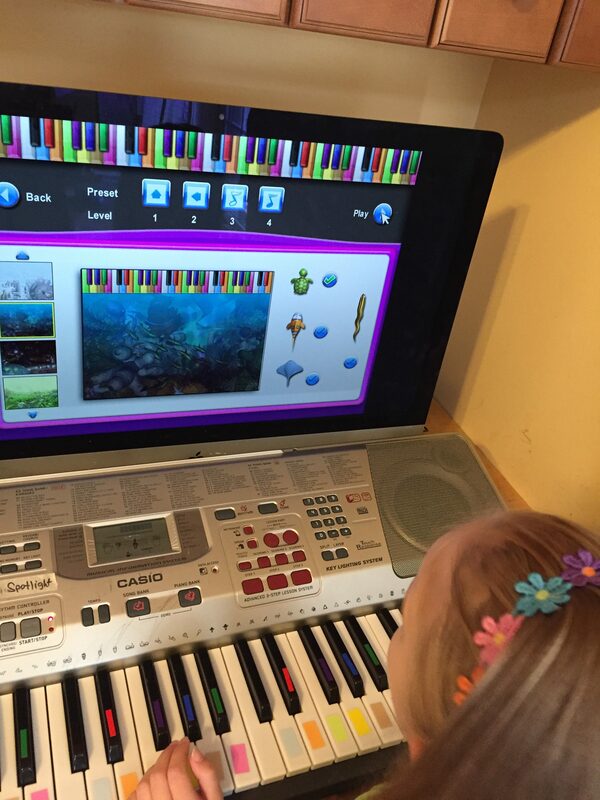 Find Great Deals on Piano Wizard at Homeschool Buyer’s Co-op! 3. They will be doing improvisation early. There is a part of the game called “Jam Mode,” which is basically free playing. 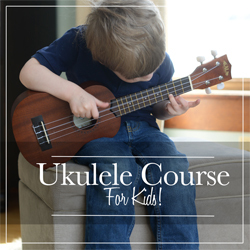 The kids can play with the accompaniment and make it up as they go! 4. 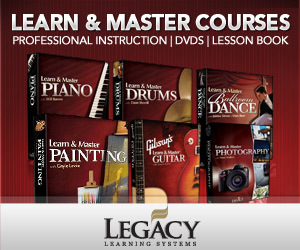 You have everything you need at home (no hiring a teacher or traveling to lessons). This is so helpful for those in a remote area, with many kids, or in a place without a piano teacher. You purchase once and can use it for your whole family! 5. Kids learn to read music quickly. I love that the goal of Piano Wizard is to get kids reading sheet music. And, they will within days (or maybe even the same day) of starting! Don and Delayna are delightful and fun in the videos. Both students and parents will enjoy them. You’ll learn all you need to know to help your student with their piano learning by watching the videos, even if you don’t play piano yourself! Piano Wizard has Gold Member Homeschool Access at their Virtual Campus, which is a social network for music learners and customers so you can connect with others using the program. Included there is a “Student Success Chart” to track your student’s progress, as well as bonus downloads and other things. There is a summer sale you’ll want to take advantage of!